EU and NATO-supported rescue flotillas based in the Mediterranean are enticing migrants to their deaths, the Libyan Coast Guard said. 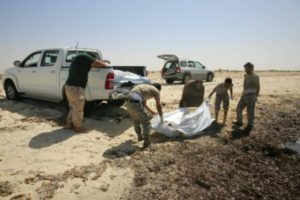 “I blame NATO and the EU for many of these deaths,” said Mirwan Issam Abudib, the deputy commander of the coast guard in Zuwarah. “Their rescue ships from Operation Sophia and suchlike now push to the 12-nautical-mile limit of our territorial waters. The migrants respond to this by trying to cross in greater numbers, and the smugglers respond by sending them to sea in s—-ier and s—-ier craft, designed to stay afloat for a few hours only. The EU’s Operation Sophia has ships patrolling just inside international waters ready to pick up migrants who are attempting to get to Europe. Libyan navy Col. Ayoub Gassim blamed Europe for “doing nothing but counting bodies” in efforts to stop the wave of migrants from Libya. Just in the past week, Libyan authorities reported more than 13,000 migrants were rescued from flimsy, overcrowded fishing boats and dinghies and an estimated 1,000 have drowned. Groups of smugglers have taken advantage of the chaotic situation in Libya to send wave after wave of overcrowded boats toward Europe, Gassim said. The smugglers are also using larger wooden boats instead of the rubber boats they were using last year. In one instance, according to the UN, a boat packed with hundreds of people was towing another overcrowded boat which lacked an engine. The second boat capsized on May 26, and the UN estimated some 550 migrants drowned.